I must say, if the Norwegian Artist ever decided to paint nudes, I would not mind these young women modeling for him. They are built — quite literally, actually — with clothes hanger frames for bodies, and a wardrobe culled from the closets and storage units around the studio and house. 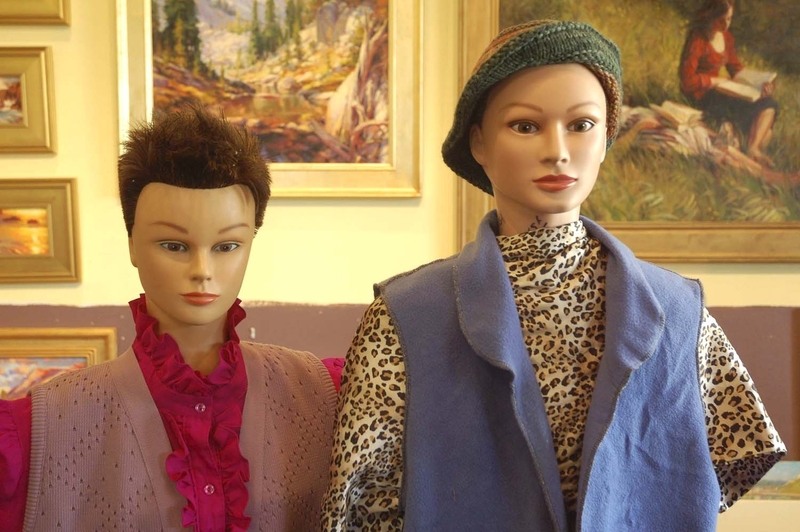 While teaching a portraiture and drawing class at the Walla Walla Community College, the Norwegian Artist mused aloud (no pun intended, by the way) how wonderful a mannequin would be — a huge step beyond the grandchild’s pink ball that the N.A. painted white for the sphere-drawing exercise. The man has only to speak before the manager is on the move, and within a week the cosmetology department of the college was contacted and the heads were hunted down and secured. We’re not used to our newest residents yet. Roxy the Dog wonders at these new studio inhabitants who look, but do not smell, like humans. The Son and Heir, closing up the studio for the night, was momentarily nonplussed by what he initially thought were late, silent visitors. In the morning, the Norwegian Artist was grateful that the Twilight Zone is not real, and that the mannequins did not move or paint anything during the night. While the mannequins are not for sale, the Norwegian Artist’s artwork is, and it is available for view and purchase at Steve Henderson Fine Art Online Gallery. More of Steve’s work is available at Samarah Fine Art, Whitefish, MT; Rive Gauche Galleries, Scottsdale, AZ; The Lawrence Galleries, Sheridan and Gleneden Beach, OR; and the Maritime Museum at Mystic Seaport, CT. The Norwegian Artist invites you to join the e-mail list for the once-a-month, short and informative, e-mail newsletter of Steve Henderson Fine Art. He also invites you to explore the ongoing series of articles about purchasing online art from private artists, Purchasing a Painting over the Internet: Is It Safe? Buying a Painting Online: Make Sure That What You See Is What You Get, and Buying a Painting: How Do I Know That an Artwork is Good?